“ESPECTACULAR. I read this riveting revolutionary tale in a day because I could not pull away from the adventures of the legendary luchadoras Latinas, Las Mal Criadas. Chief Rocka is a powerhouse, the worldbuilding is sensational, and the themes are resoundingly relevant. The LMC has carved a permanent home in my heart." "As brutal as it is beautiful, Dealing in Dreams pulls no punches, launching us on a wild, relentless ride through the cutthroat streets of this brilliantly-realized dystopian world, where hard choices can tear even the closest allies apart and danger lurks around every corner. This book will have you up late, turning pages frantically to find out what happens next. It is a marvelous achievement." "In Dealing in Dreams, Rivera sharply etches a world rooted in Latin culture where violence is the most common language, and belief in equality is a soul-stirring, revolutionary act." "Lilliam Rivera has really stepped her game up. All the voice and verve that made The Education of Margot Sanchez such an unforgettable debut are on full display here, but now she's added an incredible science fiction future that can stand proudly beside Scott Westerfeld at his best." 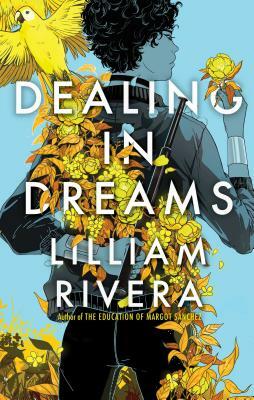 "Dealing in Dreams is yet another smart, rich, fulfilling read from Lilliam Rivera, who has, through her last two books, solidified herself as one of today's boldest YA writers. It's one of those books where, as you find yourself sprinting toward the final pages, you're at once enthralled (because it's so gripping) and terrified (because you know soon you're going to be sucked up out of the world that Lilliam has built and dropped down back into the actual real world)." * "Taking cues from Judge Dredd, Mad Max, and The Hunger Games, Rivera...has created a uniquely brutal hellscape...Readers are left with a more ambiguous—and ambitious—tale that will have them questioning what kinds of people they’d be if freed from society’s mores." "Rivera (The Education of Margot Sanchez, 2017) crafts a feminist, futurist Latinx dystopia." * "There is plenty of gritty action to propel readers through the plot, but it is Chief Rocka’s internal struggles and vulnerabilities that are the most compelling and memorable. Rivera effectively presents the complexity of female relationships, which will resonate strongly with readers....A novel exploration of societal roles, gender, and equality through the eyes of captivating lead.."
"Rivera showcases multiple intricate character arcs and details several societies through impressive worldbuilding; young readers drawn to complex action novels that challenge conventions will find this read rewarding." the novel and film The Warriors and the comic mini-series Curb Stomp, this book leaves readers wanting more of Nalah and Las Mal Criadas." "This is no gender-reversed utopia but a female-cast totalitarian dystopia that’s compelling in its treatment of how things can go very, very wrong."